bl.uk > Online Gallery Home	> Online exhibitions	> Asia, Pacific and Africa Collections	> Tomb of Etmad-al-Dowlah, Agra. 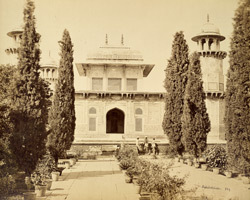 Photograph of theTomb of Etmad-al-Dowlah, Agra from the 'Strachey Collection of Indian Views', taken by Shepherd and Robertson in 1862. Itmad-ud-Daula (Mirza Ghiyas Beg) was a Persian in service at the court of the Mughal Emperor, Akbar (reigned 1556-1605). The tomb set a startling precedent as the first Mughal building to be faced with white inlaid marble and contrasting stones. Unlike the Taj, it is small, intimate and, since it is less frequented, has a gentle serenity.